In 2017 Convergent Science saw tremendous growth and success in many areas. We now have nearly 100 employees (almost double the 2014 headcount), new clients are using CONVERGE CFD to investigate pumps and compressors, and our customer base using CONVERGE for aftertreatment and gas turbine design continues to grow. We’ve done all this while also increasing our majority share of the global internal combustion (IC) engine simulation market. Our dedication to accurate and grid-convergent simulations ensures that CONVERGE offers cutting-edge CFD solutions for a wide variety of complex flow problems. Our teams dedicated to IC engines, gas turbines and aftertreatment, and new applications such as compressors and pumps ensure that CONVERGE can meet the unique challenges of each industry. The Society of Automotive Engineers World Congress Experience (SAE WCX17) once again reinforced the prevalence of CONVERGE in innovative IC engine design. In April, more than 35 papers demonstrated results achieved with CONVERGE, including publications from Aramco Research Center, Argonne National Laboratory, GE Global Research Center, Groupe Renault, IFP Energies nouvelles, King Abdullah University of Science and Technology, Oak Ridge National Laboratory, and University of Perugia. 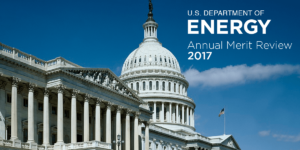 In June, CONVERGE’s utility for innovative, energy-saving research was affirmed at the annual DOE Merit Review. Seventeen programs reviewed by the U.S. Department of Energy referenced partnerships with Convergent Science and work with CONVERGE. Topics ranged from clean combustion in light-duty engines to knock prediction to soot modeling with gas kinetics and surface chemistry. Seattle played host to this year’s ASME Internal Combustion Engine Fall Technical Conference (ICEF 2017), where 25 papers featured results from CONVERGE. Topics of CONVERGE papers at ICEF included pressure oscillations in numerical simulations of IC engines, gasoline compression ignition calibration, selective catalytic reduction of NOX with detailed surface chemistry, and cycle-to-cycle variation prediction with LES turbulence modeling. Many of our most influential collaborators, including Argonne National Laboratory, GE Global Research Center, and Oak Ridge National Laboratory, presented their topics at this engaging conference in October. Two of Convergent Science’s most experienced support engineers, Shawn Givler and Sameera Wijeyakulasuriya, gave a popular workshop at ICEF that introduced engineers, students, and experimentalists to some of CONVERGE’s powerful tools for modeling heavy-duty engines. Engineers from both GE Aviation and Honeywell Aerospace were interested in CONVERGE’s ability to predict high altitude ignition and relight in gas turbines. This phenomenon has been notoriously difficult to simulate due to the long meshing times associated with complex geometries and the need for accurate, detailed combustion modeling. But Scott Drennan’s Gas Turbine team was up to the task. GE Aviation engineers gave Scott’s team a diverse range of operation conditions, and Scott’s team proved that CONVERGE can indeed accurately predict relight (or a failure to relight) across the varying conditions. GE Aviation engineers are now testing CONVERGE on fundamental and practical combustor designs for further validation, development of best practices, and optimization. 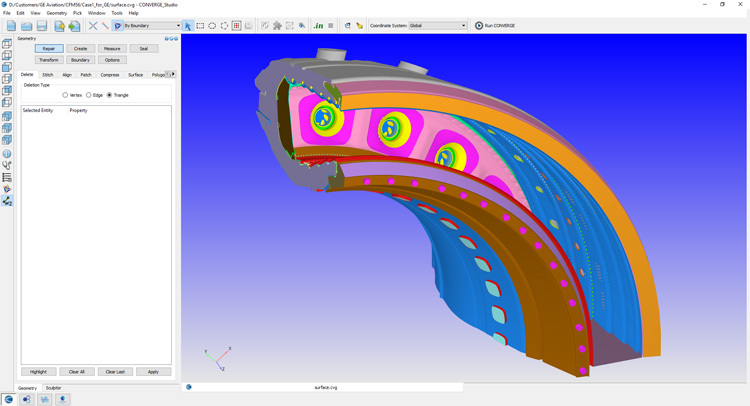 Honeywell Aerospace successfully used CONVERGE to model relight in their five-sector combustor geometry, and they noted that CONVERGE’s autonomous meshing capabilities help make CFD a viable option to assess all facets of gas turbine design. 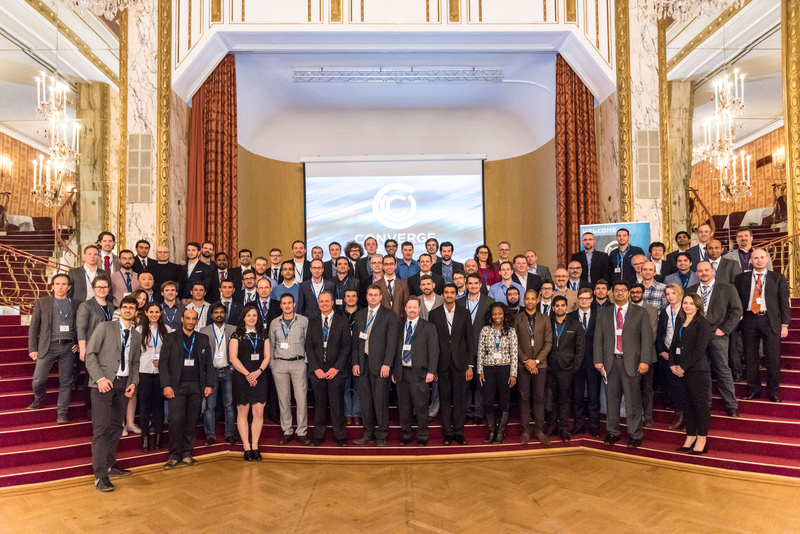 We hosted our first European user conference in Vienna in early March. This inaugural European CONVERGE experience was a big hit with European clients as well as super-users from the United States who traveled to Vienna to share and learn with their counterparts across the pond. Networking sessions included a tour of a castle and a traditional evening at a Viennese tavern. Attendees from many institutions—including GE, Groupe PSA, IFP Energies nouvelles, Politecnico di Torino, Renault, University of Rome Tor Vergara, and Volvo Cars—helped make this inaugural event a memorable one. Since so many automotive OEMs are based in Detroit, the Motor City was the perfect location for our fourth annual North American user conference. Two hundred fifteen people registered for this conference, making it the largest CONVERGE conference to date. 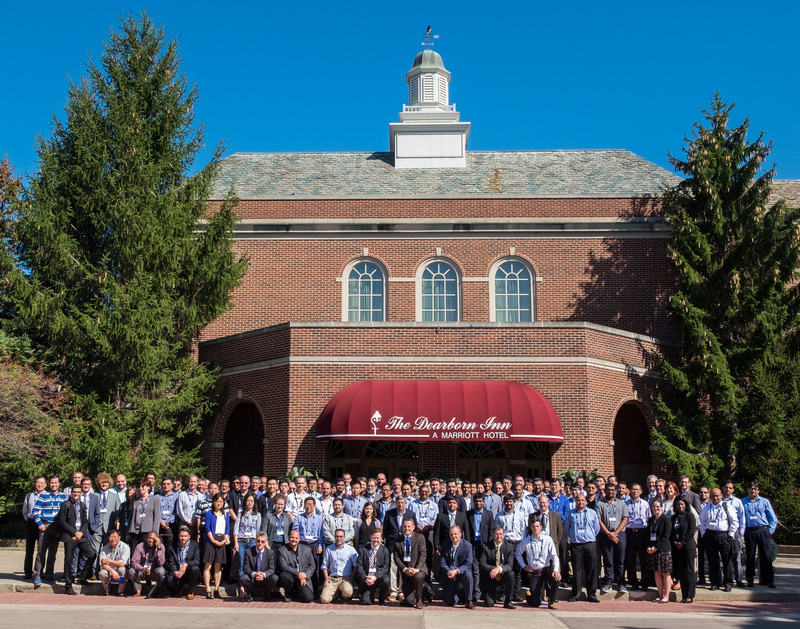 Users from 42 companies, 19 universities, and six national laboratories experienced two days of informative presentations. Many also participated in some of the introductory and advanced CONVERGE training sessions that were offered. Social events included a Ford Rouge Factory Tour and a dinner social at The Dearborn Inn. IDAJ, our distributor in Asian markets—mainly Japan, China, and Korea—has continued to provide encouraging growth in sales, promotion, and support of CONVERGE users on the other side of the globe. 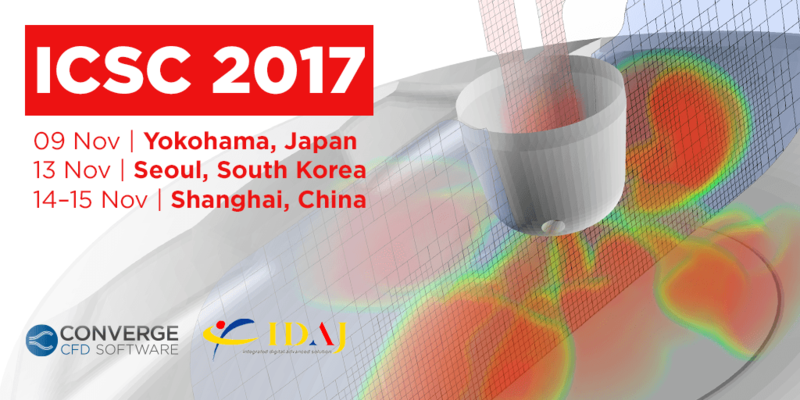 In November, Daniel Lee, Eric Pomraning, and Yunliang Wang gave users an overview of the current status and future developments of CONVERGE at the IDAJ ICSC 2017 Conferences in Yokohama, Japan; Seoul, South Korea; and Shanghai, China. IDAJ continues to host regular CONVERGE training sessions and has expanded the CONVERGE user base in the automotive OEM market, non-engine markets, and academia. Convergent Science is proud to be a member of the High-Efficiency Dilute Gasoline Engine (HEDGE-IV) Consortium launched by Southwest Research Institute. This consortium gives Convergent Science the opportunity to work with some of the brightest minds in the engine world who are working together to produce cost-effective solutions to engine efficiency-related challenges. Our Computational Chemistry Consortium (C3) was formed to bring together industry, academic, and government partners to refine existing computational chemistry tools. C3 is now in full swing, with a major global automotive OEM leading the way. With more than twenty years of experience developing comprehensive chemistry models to help predict real fuel behavior, Professor Henry Curran is well-positioned as Chief Technical Advisor of this consortium. Professor Curran and I are guiding C3 in its efforts to develop new models, tools, and mechanisms to lead the advancement of combustion and emissions modeling for the entire scientific community. A great opportunity presented itself when CEI (formerly our distributor in India) closed its office in Pune: Ashish Joshi, former CEI India manager, master of all things EnSight, and CONVERGE super-user and distributor, agreed to be the leader of our newly formed CS India office. Ashish is now helping to sell CONVERGE and support users in India and southeast Asia. According to Ashish, a distinct possibility for huge growth in the engine design market in India exists because by 2020 engine manufacturers will be held to a much stricter Euro VI-level emissions standard. This is an exciting time to have a solid foothold in the Indian engine design market. Founded in December 1997 by a group of University of Wisconsin-Madison graduate students, Convergent Science (originally Convergent Thinking) made its debut as an engine CFD consulting group. Twenty years later, CONVERGE is now the global leader in IC engine CFD simulation and is continuing to grow in this market and in others. In 2018, we are looking forward to continuing to expand CONVERGE’s presence in the European, Asian, and Indian automotive markets. Equally exciting is our ongoing expansion into the compressor and pump industries, which are primed to implement accurate transient CFD. Finally, 2018 is a special year because it marks CONVERGE’s 10th anniversary as a commercially available CFD code (keep your eye out for a blog post commemorating this event in just a few months!). We look forward to bringing continued innovation and superlative customer service to all of our clients. Want to join us? Check out our website to find out how CONVERGE can help you solve the hard problems.